There are 6 reviews of Ed Hardy Born Wild For Men. Ed Hardy Born Wild for Men (2010) was released alongside Hearts & Daggers for Men (2010) in much the same oblong packaging with oversized cap covering the bottle and Hardy's tattoo work wrapped around, being yet another trip into the strange by perfumer Olivier Gillotin. I swear that every masculine I've smelled by this house is either way ahead of the curve creatively, or just too odd for its own good, and often marred ingredients-wise by budget restrictions. In any case, if the salty olive martini plus aquatic notes of Hearts & Daggers for Men didn't quite appeal, maybe the pink pepper and amber of Born Wild for Men will better suit. To be clear, this is a very fruity scent and almost a throwback to the previous decade with ozonic top notes, although Love & Luck for Men (2008) had them too so maybe it's part of some house accord for the brand. If you love the quirky, garish vibes of Ed Hardy style anyway, all of these masculines will probably be your cup of tea, but for more "scrupled" colognoisseurs, this will probably offend like all the others. As an aside, some people have compared this to Creed (as Ed Hardy fragrance seem to constantly be for some reason), with the later Creed Viking (2017) the target. Well, I just don't see it, and they share almost nothing in common save maybe some of the citrus. Born Wild for Men opens with apple and orange, candy-sweet and ozonic from the start, with a zest and zing one might expect from a late 90's or early 2000's youth-marketed masculine, the kind vintage guys love to hate on as the bane of their existence. From there, a bit of cardamom and ambrette comes in to offer some balance, but the spice and slight muskiness these ingredients provide do little to mask the sheer volume of the fruity ozone, so love or leave it fellas. Things get more interesting when a neroli note comes in from the heart, floating on some jasmine hedione and carrying a 500-megaton nuclear warhead of pink peppercorn in tow. Seriously, if you love stuff like Molton Brown pink peppercorn shower gel, or all the 2010's fresh woody ambers that usually have pink peppercorn in the top, this might be your ticket. The pink peppercorn dominates after about 30 minutes, taking your attention away from the sweet ozonic 90's opening, and here it stays until Born Wild's amber base makes its entry. This amber is pretty similar to Avon amber, giving me huge Avon vibes from the stuff, but things go in a greener direction when norlimbanol "sandalwood", Iso E Super, patchouli, and something claimed to be "Palo Verde" (an aromatic tree found in California) appear. Whatever the synthetic green note in the base is, it helps steer things away from being cloying. Wear time is average at about 8 hours, and sillage is loud at first, but goes down to something tolerable after the first hour. I'd say the loudness and sweetness make Born Wild a good clubber scent, even if it gets kind of calm in its later phases, so just make sure you can reapply if you need that dayglow opening to return. 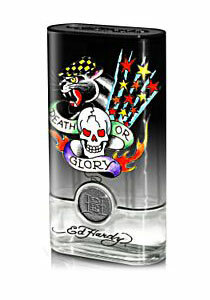 Born Wild for Men doesn't seem to get as much love compared to other Ed Hardy masculines like the previous Love & Luck or the later Villain (2011), and since Christian Audigier's passing, the brand has returned to the hands of the actual Ed Hardy once again, who has not really made any new fragrance since then. This sorta leaves all the Audigier-produced and (mostly) Gillotine-composed Ed Hardy fragrances in a sort of zombie march: a house carrying on with no leadership or new product while agreements with EA Fragrances continue to fill shelves with new batches of the existing catalog. Born Wild seems to be a bit rarer than the rest and sometimes carries a slightly-higher price tag from resellers for that reason, but there is plenty being pumped out and floating around (especially testers) for the curious, so don't get fleeced by opportunists, especially not when overstock sites are still bursting with this and other Ed Hardy scents. Overall, this is one step away from being a man's fruitchouli, which means by rights I should hate it, but there is a certain "tasteful tackiness" about it which keeps me sniffing, so I give it a thumbs up with the caveat that I have an affinity for kitsch. Another amusing entry from the house hobbyists love to hate, but tattoos themselves are also polarizing to people of "refinement", so it is apropos overall to the market niche the brand has carved for itself regardless of who is at the helm. I found the top notes had a surprising hi-end fragrance aroma. But the dry down, while pleasant, became a generic drug store men's toiletry scent. Now,in 2018, I can't complain having paid $13.50 for a 3.4 Fl.Oz. bottle on eBay. And that included no tax or shipping charge. This blew me away when I first got my nose on it in 2010 and was my signature scent for a few years after. Sweet orange and apple up top that really lasts the life of the scent! Also with the sweetness in the beginning, it's quite spicy as well thanks to cardamom and pink pepper with some delicate florals in the background that creep in midway through. All drying down on a well done and dominate coniferous woody base. Really aromatic as well. Extremely versatile,(every season but extreme summer heat IMO)very low price, long lasting and terrific/unique smell. More so in 2010 when it was released before the current "pink pepper" craze. Still a wonderful scent that will anyways have a spot in my heart, as well as my collection. Thumbs way up for me! Well when i read the reviews i thought ...Oh Gosh i have wasted money. I brought it blind because i found it so cheap. But this is a very pleasing fresh and clean fragrance which is very inoffensive. It starts out as Lots of Sweet Orange. After half an hour Pink Pepper starts to dominate. In the end we have some wonderful woods laced with pepper and a hint of Orange. I Liked it a lot. Its nothing very special, But Nothing Bad. I would say It is great Value For Money. It Lasts 8 plus hours on me. Godd Job Mr. Olivier Gillotin...Bravo. Such a strange and fun fragrance is Born Wild. It comes off as a bubble gum type smell with apples and pepper. The bubble gum vibe is really authentic, like the gum from the tree, not like some synthetic fruity mess. This scent slightly reminds me of Polo Modern Reserve and Michael Jordan for men, but much less mature. Longevity is around 7-8 hours on me, and projection is about average. Certainly one of the better Ed Hardy scents as others have noted, but that doesn't say much. There are no member images of Ed Hardy Born Wild For Men yet. Why not be the first?